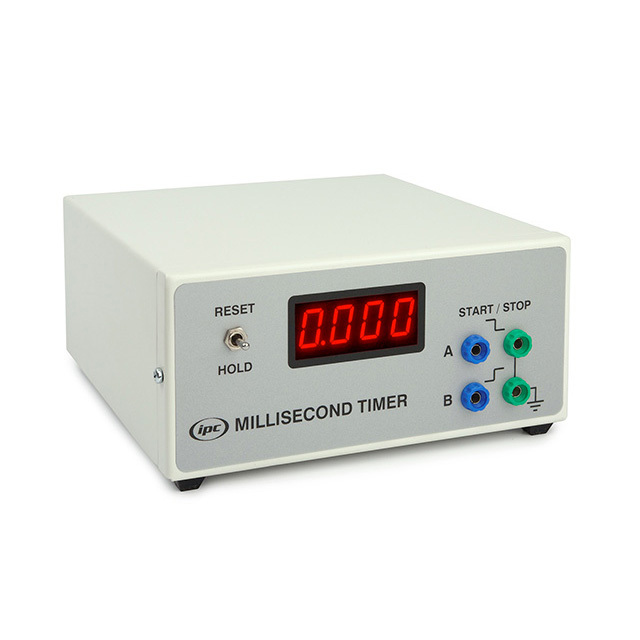 This timer (IPC-3834-T) is most suited for an investigational approach for students to gain a sound understanding of the concepts of time and motion. Two pairs of sockets alternately start and stop the timer, one pair operating in make mode, the other in break mode. The start/stop switches can be either mechanical or electronic. The timer is autoranging for ease of use and has a clear 13mm LED digital display. We recommend using the IPC Photo Timing Gate (IPC-3210-T) for all start/stop timing applications due to its ease of use, accuracy and repeatability. Built into a robust metal case with a durable powder coat finish. An illuminated on/off switch is mounted on the rear panel adjacent to a fused appliance inlet. A document containing descriptions and diagrams of how to set up the ‘g’ by Freefall apparatus and connect it to the Millisecond Timer has been compiled by us.